Mahiki is the world famous, award-winning Tiki bar and nightclub with a celebrity following and welcoming open- door policy. Recently celebrating its 10th anniversary, Mahiki club in London now revs up its Polynesian playtime glamour. February sees the launch of Mahiki Coconut Rum, and later this Spring, the brand new Mahiki bottled cocktails. They will be distributed by Cellar Trends in the on and off trade. Mahiki bar manager and Tiki cocktail expert Georgi Radev teams up with Cellar Trends and promoter katl-ist for the Mahiki Coconut roadshow, starting with Edinburgh and Cardiff. These high-concept Mahiki-make-overs will run for several nights and host trade guests and parties for consumers. They feature celebrity DJs and personalities from TV’s Made in Chelsea and TOWIE, and include Alex Mytton, Rosie Fortescue, Hugo Heathcote, Mark Wright and Kara Rose Marshall. 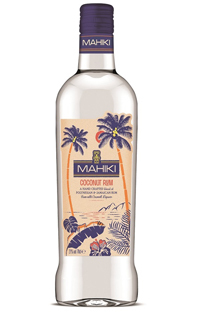 Mahiki Coconut Rum liqueur 21% abv is a blend of Jamaican and Polynesian rums with Western Samoan coconuts. The off-trade guide retail price for the 70cl bottle is £14. Three new Mahiki bottled cocktails in single serve 20cl bottles will also launch for the on & off-trade, with a shop retail guide price of £1.90. Treasure Chest, Pina Colada and Coconut Grenade are distinctive cocktails from Georgi Radev’s menu at Mahiki club. Mahiki Coconut Rum liqueur captures all the style and vibrant fun of the dynamic Mahiki brand. Mahiki club is a renowned destination for fresh fruit & rum cocktails, with a menu featuring over 100 rums from all over the world. Mahiki has clubs in London, Dubai and Abu Dhabi and is looking to expand to new global locations. The brand is well known for its high profile pop-ups, attracting many celebrities, at events such as V Festival, Henley Royal Regatta and Polo in the Park. The clear glass 70cl Mahiki Coconut Rum liqueur bottle has been designed by the exuberant British street fashion designer Henry Holland. It features bright, colourful Polynesian tiki motifs, Hawaiian botanicals and flora.